Ahh, Sand Castles. The perfect activity to do at the beach. Most people are used to doing it with an ordinary beach bucket and a shovel, but there’s a more professional way. 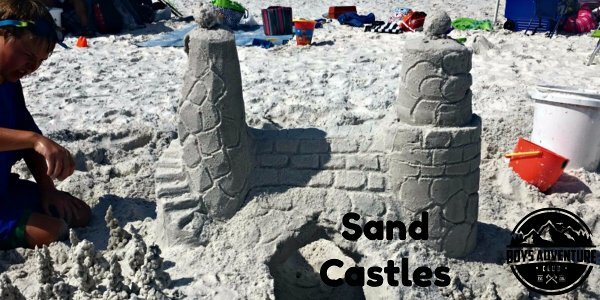 When we were in Florida last year, we found out about beach sand castle lessons. On the morning of our lesson Rick ( The owner of Beach Sand Sculptures and super nice guy) showed up with his team and a ton of buckets with the bottoms cut out. Cut of the bottoms of one 1-gallon bucket and one 5-gallon bucket. Put everything in a bag. Start by making a pile of sand about 3 feet high and add water on top (remember to not dig deep holes because turtles can get trapped in them). Lay the 5-gallon bucket on top of the sand pile (the top of the bucket goes on the bottom) and fill the bucket about half full with sand. Fill it up to the top with water and stir with hand. Tap on the sand to harden. Repeat steps 2-3 until the mold is completely full. Wait 10 minutes and lift the bucket. Repeat steps 2-4 with the 1-gallon bucket. Give detail to your sand castle. The icing spatula can be used to cut off parts of the castle to make it whatever shape castle you like. The big side of the melon baller can be used to make doors and the small side to make windows. The straws we used to blow off extra sand that was loose. The hack saw blades were used to make brick in the castle. The end of the wooden brush can be used for stone towers and walls. If you want to make sand trees you can mix half water half sand together and drip the sand to make very real looking sand trees!